Don’t bust your budget purchase a transportable bleacher set from BuiltRiteBleachers.com and share the one set with multiple sports fields. 5 Row - 24'L -Transportable w/Single Footplank- Seats 80 - Weight 1658lbs. 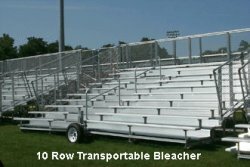 5 row x 24' non-elev trans bleacher- Net seating capacity 80-Galvanized steel understructure-(with transport wheel brackets and additional transport bracing)-2 X 10 anodized aluminum seat plank-Single 2 x 10 mill finish aluminum foot plank rows 2-3-Double mill finish aluminum foot plank rows 4-5-1 x 6 riser row 4, (2) 1 x 6 top row risers-2 X 6 Treated lumber groundsills-Chainlink guardrail system. Important Note: The BRB-TKL 5 Row Wheel Kit (Mechanical) is required to make these bleachers operational, one kit can be shared among many 5 row transportable systems. Be sure to add one with your quote/order, see "Frequently Bought Together" below.